HTC has announced that it will soon be making the Vive wireless, making its cord-cutting adaptor available outside of China. Last November we reported on a new add-on that came out of HTC's ViveX accelerator program, produced by TPCast, but at that point it was only available to order through Vive's China site. At CES 2017, though, HTC has announced that the accessory will be available to pre-order for the rest of the world in Q1 this year. The module attaches to the headset allowing you to roam wire-free, though you'll still be limited by the room-scale tracking sensors. Still, it's a welcome addition to the experience, lasting for two hours on a single charge. The adaptor will cost $249. But that actually wasn't the most exciting thing HTC announced – in my opinion the Vive Tracker is a far more interesting addition to the ecosystem. This is 10cm wide accessory that can be attached to any object and will turn it into a VR controller compatible with the Vive's tracking tech. The early results are pretty amazing. Trust me, I've tried it. 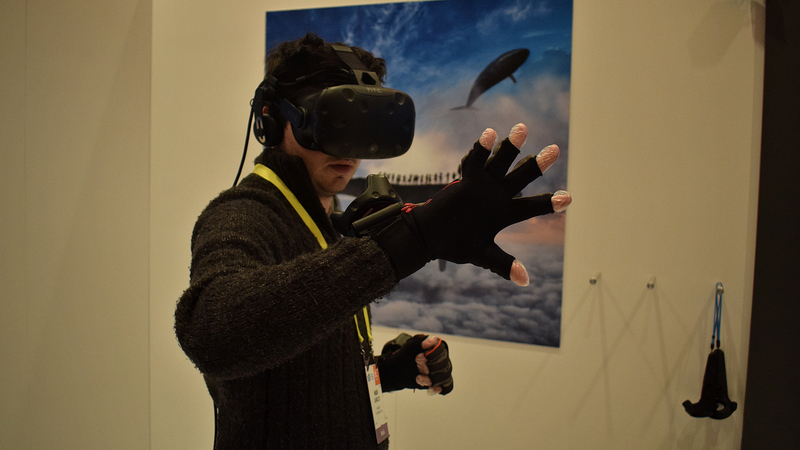 At the Vive CES event, company Noitom was showing off a pair of gloves which use a tracker each – combined with a separate bluetooth sensor – to give you full use of your hands and fingers in VR. So a bit like Leap Motion. The added freedom afforded by the tracker cannot be underestimated, but this was just one example of countless potential ways the Tracker could change the game. I was able to use my hands to pick things up, throw them about, and even draw with my fingers. Going back to the Vive wands after this is going to feel like a bit of a step back. I also tried a baseball simulator designed by TrinityVR – with a real baseball bat. The Vive Lighthouse sensors can detect up to five trackers at once, potentially all doing different things. The Tracker will be available to buy in Q2 this year, but HTC is yet to announce a price. It says, however, that it will give away 1,000 free ones to the developer community and peripheral partners. Also worth mentioning is the new Deluxe Audio Strap, which makes putting on and taking off the Vive easier thanks to a new sizing dial, as well as integrated headphones that make wearing the Vive similar to Oculus's experience. This will be available as a separate accessory in Q2, with a price to be announced nearer the time. There was also big news in the software department at CES. HTC announced it will be introducing a subscription service for its Viveport that will give users access to a bunch of content each month, while also helping developers to monetise their creations. Viveport was introduced to put more focus on software beyond games and give Vive a platform outside of Steam, but there are games like Fantastic Contraption in the mix too. The subscription service will launch early this year, but HTC hasn't yet told us how much it will cost. Finally, we were told the Vive would be getting dedicated app stores for arcades and enterprise. We're particularly excited by the first of those two, with VR helping arcades see a bit of a comeback right now. We'll be interested to see if a dedicated store can help bring the VR arcades of our dreams to life.